5. Bloc Party - "This Modern Love"
4. the White Stripes - "My Doorbell"
3. Kanye West (ft. Paul Wall) - "Drive Slow"
2. Clap Your Hands Say Yeah - "The Skin of My Yellow Country Teeth"
1. Wolf Parade - "I'll Believe in Anything"
Werewolves are the new pirates. You were probably thinking ninjas would be the new pirates, but they too will jump the shark if they already haven't. So think about it. Werewolves. Yeah, that works. Getting rid of the things in your life that you don't need. That's it. This includes things such as deleting pointless phone numbers, removing friends from Facebook, or in the case of Adam, retiring from the Benedictine party community (finally). My mission has been centered on removing the various phone numbers of people who I know that I will likely never call again and also trimming down my Facebook friends and groups to include only the most important. The remaining friends on my Facebook are only my good friends at Benedictine and my friends from high school who I like to keep in touch with. Otherwise, you're outta there. It's not meant to be a malicious thing. It just makes my life simpler and easier. The influences for the Cut the Fat movement (CTF) are far-reaching. They include, but are not limited to: Douglas Coupland's Generation X, the George Foreman Lean Mean Fat Reducing Grilling Machine, and of course, Adam's untimely drunken outbursts directed at certain stupid girls. As I said, Mr. Hansen has retired from the Benedictine party community after a few unfortunate incidents and the pestering of his friends. This has been a major component of the CTF. Furthermore, in a move inspired by both Jerry Poro and Vin Diesel, Mr. H (as his students call him) has even quit the Facebook. Though this is a commendable action, it is not one that is necessary in the CTF. The Facebook is valuable as a way to keep in touch with old friends, and in my case, meet a wonderful lady. Nonetheless, the dedication shown by Mr. H is one that should be applauded. When all is said and done, it is our sincere hope that CTF will enrich our lives. We encourage you to take a look at your life and get rid of what you just don't need. I got paid a bizarrely awesome compliment tonight. Normally, my boo specializes in these, but this one came from a highly unlikely source. Earlier this evening my sister told me she had to tell me what Chelsey said about me. Chelsey is my sister's classmate and friend from way back, like age 3. She is also Tyler's (the Feedback Whales guitarist and my oldest friend) sister. Needless to say, due to our age differences her and I have no communication whatsoever. This is what made the compliment bizarre. ANYWAY, Sis began by telling me that Chelsey was shocked that I was on Myspace, which seems weird because just about everyone is on Myspace. She then proceeded to tell me that her and Tyler were talking about how I knew about "every band" and how it was "so cool that I could know so much about so much music." If you know me, you know that I take a small amount of pride in my musical knowledge, and that I constantly search for interesting things. So to know that the guitarist from my band and his sister marvel at my abilities is kind of neat. I don't know how they could have possibly began this conversation, but the fact that I know it took place is fun for me. This was one of the high points of my day, along with a call for a job interview. Also, hearing my girlfriend sound happy and excited on the phone was definitely a pick-me-up. Made me want to be with her tomorrow even more than I already did. I'm really confused about what I look like to other people. It is quite common to try to compare people you know to famous people. Adam, for example, is widely believed to be very Will Ferrel-esque. But I seem to be unclassifiable. As proof I present to you the strange array of people I have been compared to. Justin Timberlake - this is the most common comparison that I get. In high school, I once signed a Justin Timberlake autograph while at the mall. 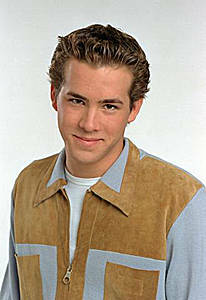 Ryan Reynolds - this originally was a Grandma only opinion, but lately people at work have been saying it too. At first I thought it was due to my beard, but even after I shaved one guy was afraid I would kill him with an axe just like Mr. Reynolds in The Amityville Horror. 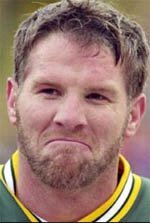 Brett Favre - I wish I could play football like Brett Favre (and I bet he wishes he could too), but I really see no similarity except for blue eyes. I think another mitigating factor would be that he has roughly 15 years on me. I don't get it. 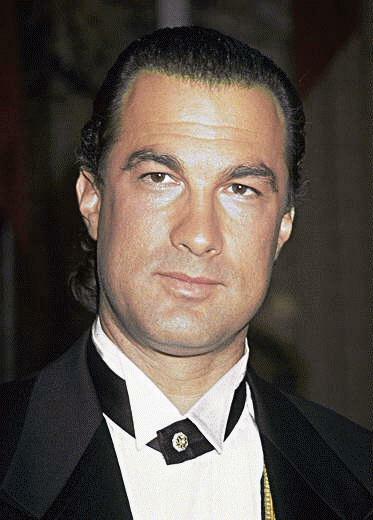 Steven Seagal - this is surely a Grandma only opinion, right? I can't see anyway that me and the most lethal man to ever have a ponytail look alike. It should be noted that my grandma is not blind and/or senile. After seeing these pictures, you can see why I am confused about who I look like to other people. So please, let me know who you think I look like so that I can begin the casting for my biopic. As you can probably figure out, that is more than 10 albums1. But I think those are my favorite releases of 20052. Some of these I am surprised were released in 20053, but that helps make the list even better. I shall finish said list by the end of the month. A few notable exceptions to this preliminary cut: Lullabies to Paralyze - Queens of the Stone Age, Guero - Beck, Howl - Black Rebel Motorcycle Club. All 3 are highly recommended, but not quite as strong througout as the above mentioned. Those are: Bloc Party, LCD Soundsystem, M.I.A., and Kaiser Chiefs. It seems like those have been out forever.